If you ask someone to tell a dish in Paneer, I bet they would for sure say "Paneer Butter Masala". This is such a popular dish and loved by everyone. The first thing that comes to anyone's mind about Paneer Butter Masala would be it's rich colour. Though, we all use the same base ingredients, we don't use the same method. Here is my way of preparing this yummy dish...Hope you all love it. 1. Add 1 tsp of butter and fry paneer till golden brown. Keep aside. 2. To the same pan, add 1 tbs of oil and then add cumin and onion. Saute for few minutes. 3. Now, add ginger-garlic paste and fry till the raw smell is gone. 4. Add tomotoes, saute for few minutes. 5. Add coriander powder, garam masala, salt, sugar and red chilly powder. Mix well. 6. Now, add cashew and milk. Allow the contents to cook for about 10 minutes in medium heat. 7. Once the contents get cooled, blend till smooth. 8. Add the remaining butter and the contents from the blender. 9. Drop fried paneer pieces and medium the flame. 10. Cover with lid. Cook for about 15 minutes. 12. Serve hot with Indian Bread or Rice. Hi. Have never seen cumin flavored paneer butter masala, sounds different. Very innovatine and curry looks so creamy! paneer butter masala is my favorite too ...ur dish looks very inviting . What a lovely pic dear. Love paneer butter masala and you are right, this the most favorite dish of paneer. I would never say no to paneer..lovely and mouthwatering dish..! What a creamy, rich and delicious curry! delicious one... Should be great with roti/poori... Believe me the word verification here is "Poories"
Delicious Paneer Butter Masala. All creamy and perfectly done. Loved the presentation too. 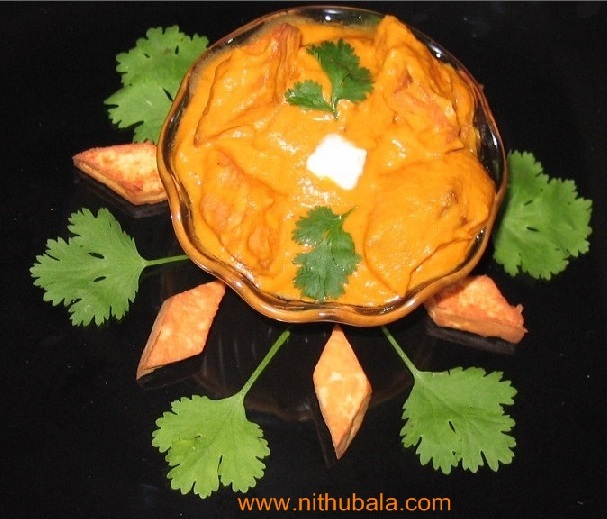 My all time favourite..wat a vibrant colour..
Paneer masala looks delicious and very nice color. Its my favorite !!!! I love paneer!! Its so yummy!!! Looks very creamy and rich and also nice color. Long time Nithu will come back to catch up with other posts soon. wow! looks creamy and thick! yummy!! wow ! luv this..my all time fav curry..loved the diamond shape paneer..
A unique and interesting recipe...! Lovely colorful shots...! Superb dear.